For the 35th Lab Animal Week, a week of action was held against Air France for the role it plays in the brutal trade as the sole passenger airline transporting primates for experimentation. 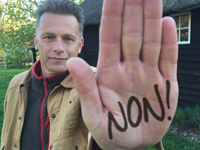 Chris Packham, Wendy Turner Webster, Peter Tatchell, Carol Royle and Ben Goldsmith joined the NAVS and our supporters in saying ‘NON!’ to the Air France monkey flights. 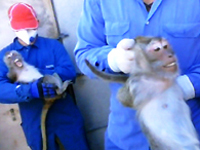 The NAVS has previously reported on shocking conditions at laboratory primate supplier, Nafovanny, in Vietnam. We subsequently found that when the Home Office inspected Nafovanny, the inspectors were simply directed away from the areas of concern. It is clear the effective regulation of international dealers supplying UK laboratories with animals is a very difficult task; nevertheless, government officials must improve their performance on these inspections. There was a limited response to this Declaration in Directive 2010/63/EU on animal experiments, which bans the use of apes and wild caught monkeys in experiments and calls for feasibility studies and a timetable for the phasing out of use of F1 primates (monkeys born of wild caught parents). This latter provision is an important step, as currently, monkey dealers are able to restock their factory farms from the wild, whilst governments can still claim to have prohibited use of wild-caught monkeys in laboratories. The UK is one of the largest users of laboratory monkeys in Europe and so has a profound impact on the trade. Make it a priority to implement the European Directive prohibition on F1 primates. official target to focus on ending the use of apes and wild-caught monkeys in scientific research. establish a timetable for replacing the use of all primates in scientific experiments with alternatives.